A notable lack in speculative fiction, and one that cuts across the divide between Christian and secular, is that of genuine, fully-realized religion. There may be religious belief and religious feeling; in Christian speculative fiction, there usually is. There may be scraps of religion – vague expressions of faith, a benevolent priest, a fanatic, a cross or a stray invocation of the gods. But genuine religion – religion that possesses a structure, doctrines, holidays, customs, stories and rules, and all the physical artifacts from temples to jewelry? That is rare. This lack is hardly crippling. Great speculative fiction may exist without practical religion and even be deeply spiritual. Lord of the Rings and Chronicles of Narnia exhibit little of religion as it is practiced in actual life and possess spiritual depths rarely matched. Complete religion isn’t necessary. But its scarcity in our novels is a loss. You may ask, Why Snoopy? And I answer: The other images Google gave me were too ugly. To gain an idea of the loss, let us consider Halloween, because ’tis the season. There are surely people in this great nation whose favorite holiday is Halloween, and I frankly worry about these people. At best, it’s a half-holiday. There is a version of Halloween for children, and a version for adults, but no version for everyone. As a popular holiday, it makes no pretense of religion or meaning; it has no songs and most Halloween stories could be told without Halloween and probably would be. And out of even this poor half-holiday you could dig a tale that teaches us who we are. The origin of Halloween is taken to be Samhain, the Celtic holiday that marked the journey of the dead into the otherworld. Ghosts were near on Samhain, too near for anyone’s comfort. The inhuman, both demons and fairies, were also believed to be abroad with power, perhaps because the journey from this world to the next suggested a general weakening of boundaries. A spiritual anarchy hangs about the whole day, and to the extent that there was real belief there must have been real fear. 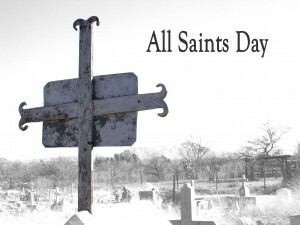 The Catholic Church later established All Saints Day and All Souls Day, days that commemorate the dead without fear of the dead, or horror of death. It’s long been said – very plausibly, though I admit I don’t know on what evidence – that the Catholic Church did this to replace Samhain. And Samhain did fade away, leaving only vestiges of customs and superstition where powerful belief once ruled. Yet All Saints Day and All Souls Day never replaced it. These are just days on the church calendar, occasionally observed but never celebrated. Much can be gleaned from the history of Halloween – the revolution of a civilization changing from one religion to another, humanity’s elemental horror of the dead who do not stay properly dead, the dread of the inhuman, the evolution and mixing of beliefs and practices. It is strange that, although many people believe the saints are happy in heaven and few think ghosts travel on Halloween, Halloween has so much greater a presence than All Saints Day. An empty holiday with concrete practices has more power than a holy day with abstract joy, and we see how instinctively humanity demands, and perhaps even needs, physical expression of spiritual things. What can be illustrated through a holiday – from the history of a civilization to religious beliefs to fundamental human nature – is extraordinary. Holidays, and all the expressions of a whole and genuine religion, offer a wide and rich opportunity to speculative fiction authors. I don’t demand that they take it, but – well, would you consider it?